One of the most important features of your pool is the liner. 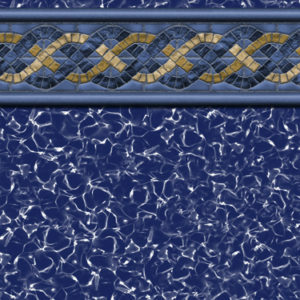 Fox proudly offers quality liners available in a variety of patterns and colors, allowing you to customize the look of your pool. Our liners are made from 20, or 28 mil virgin vinyl that is formulated with ultra-violet inhibitors and anti-bacterial agents to ensure long life. As is always the case, proper application and use of chemicals will ensure that your Fox liner will last many years. Precise fit is essential to making sure the liner doesn’t become stretched, which could cause premature failure. All Fox liners are made by our custom liner shop to exacting specifications. With a Fox liner, you get the luxury look of tile, but none of the constant maintenance and cleaning that comes with actual tile. The smooth surface of your Fox liner will not cause scratches or abrasions like concrete can. Fox vinyl liners are not only for new pools, but can be custom made to fit your existing pool. — Latham vinyl liners for above-ground pools are manufactured using the same processes as our legendary inground pool liners. Virtually maintenance free, Latham above-ground liners are easy to clean and smooth to the touch. — Latham above-ground liners are made from the finest vinyl and treated with a special fungicide to inhibit bacteria growth. — With Latham above-ground liners, above-ground pool owners can have the same spectacular look as inground pool owners. From rustic stone look to geometric and mosaic designs, Latham offers a variety of elegant patterns to complement any back yard or poolscape.